is an “Amazing Lady” who at any time in her life has been diagnosed with Ovarian Cancer whether she is currently a patient in treatment or cancer free. It could have been yesterday or 50 years ago. We honor these “Amazing Ladies” in a variety of events and programs including invitations to participate in our T.E.A.L.® Survivor Ceremony during our Annual T.E.A.L.® Walk/Run program in cities across the US. We offer free programs and services for survivors and their families all year long. Funding cutting edge research that can improve the lives of ovarian cancer patients in the foreseeable future. Free T.E.A.L.® Workshops offered at the T.E.A.L.® headquarters in Brooklyn are now available! Learn more about these workshops for survivors, patients, caregivers, & their families. Any help that addresses the needs of Ovarian Cancer survivors through the collaboration between our office and our partnerships. We pay tribute to Ovarian Cancer Survivors and their courage in the face of such a difficult diagnosis. 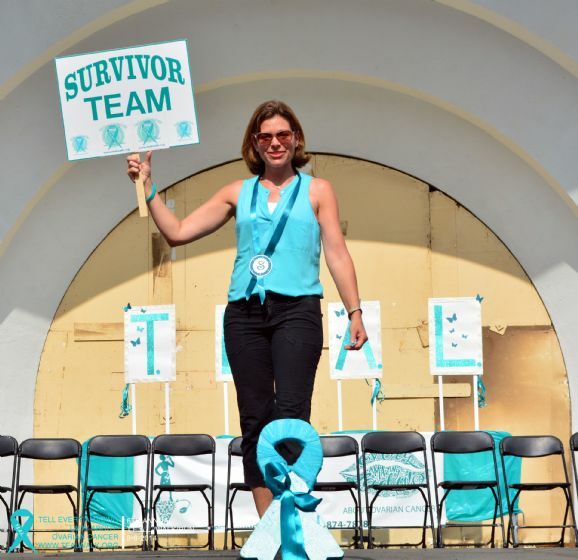 T.E.A.L.® hosts and participates in a series of survivor events and services that connect and empower Ovarian Cancer Survivors and their families. Through our events, especially The Annual T.E.A.L.® Walk/Run in Brooklyn, we have been able to create a network of support and a feeling of community among the participants. Our supporters often refer to our organization as a “family”. Survivors often note that the sense of connection at our events is therapeutic and empowering. We educate and inform survivors about their health and wellness options by providing resources at our events, online support, and access to our partner organizations throughout the year. We also form partnerships with hospitals conducting research. We fund research that can improve the lives of those with Ovarian Cancer or those at risk of contracting Ovarian Cancer. T.E.A.L.® has collaborated with Maimonides Medical Center to print genetic testing brochures with information about how to get genetic testing and why it is important in evaluating risk in Ovarian Cancer survivors and their families. T.E.A.L.® funds scientific research programs at some of the country’s most prestigious hospitals including John Hopkins University, The University of Washington, Massachusetts General Hospital, and Memorial Sloan-Kettering Cancer Center. 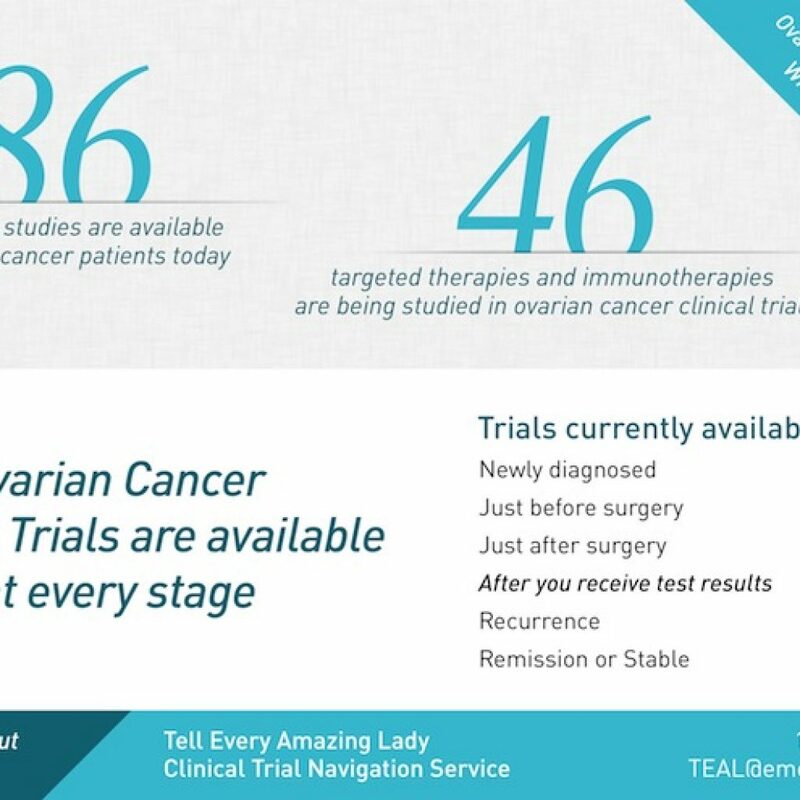 Tell Every Amazing Lady® Clinical Trial Navigation Service: We want Ovarian Cancer patients to be aware of all treatment options. T.E.A.L.® is working with EmergingMed to offer a way to take action – a free, unbiased, confidential, personalized service that helps patients understand which ovarian clinical trials may be an option for them. Clinical trials are research studies that test how well new medical approaches work in people with early stage or advanced cancers. They have a natural place in the patient’s care as doctors strive to improve current ovarian treatments and search for new and better ones. How does this service work? We help patients quickly search for clinical trials that match each patient’s specific diagnosis and treatment history. We recommend that each patient search for clinical trial options before starting the first treatment and again at any time when the patient is faced with a new treatment decision. Our service helps Ovarian Cancer patients stay informed about all their choices. We never want to hear someone say: “ I wish I had known about that option earlier”. The service is free, unbiased, and completely confidential. 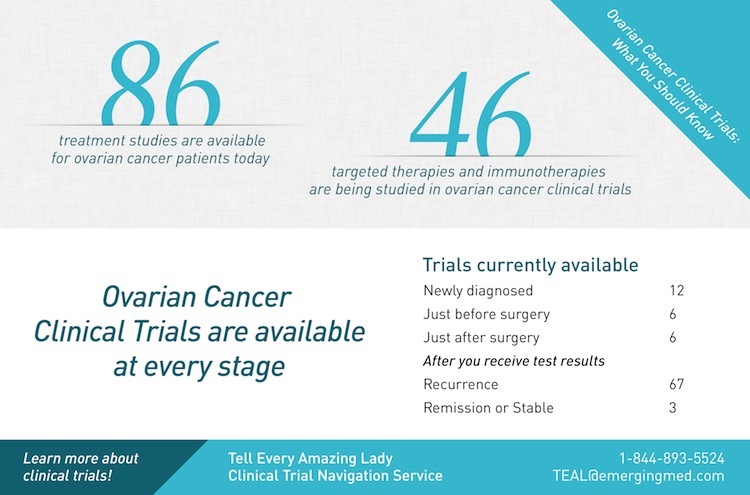 We also encourage Ovarian Cancer patients to call 1-855-216-0103 or email TEAL@emergingmed.com for additional help finding clinical trials that match their situation and to learn more about cancer research. Our clinical trial navigators are available Monday through Friday 9 AM to 6 PM EST. Educational Survivor Course Program: T.E.A.L.® has helped fund some of the series of Survivor Educational Courses hosted by the Foundation for Women’s Cancer. This program directly impacts the lives of survivors. These events are created to provide valuable resources and information to Ovarian Cancer Survivors about medical and health options available to them including clinical trials and opportunities to ask questions directly to medical professionals. T.E.A.L.® has had a table at many of these courses and has contributed invaluable informational materials to the course. As one of the sponsors for this program, T.E.A.L.® has attended programs in Long Island, NYU hospital, and has also traveled to programs in Boston and Washington D.C. to fulfill its mission outside of NYC. Survivors Teaching Students® (STS) program: The goal of the STS program is to increase the number of healthcare providers who recognize Ovarian Cancer symptoms and refer woman suspected of Ovarian Cancer to gynecologic oncologists to diagnose and treat the disease in its earliest stages. The STS program aims to educate the next generation of medical professionals to save women’s lives. The Ovarian Cancer National Alliance (OCNA) works through its partner members and affiliates to offer the program at no charge in more than 90 U.S. Medical schools. As a partner member of OCNA, T.E.A.L.®’s CEO has spoken to students at the SUNY Downstate Medical Center from the perspective of a family affected by Ovarian Cancer emphasizing importance of genetic testing and sharing the story of her late sister and co-founder of T.E.A.L.®, Louisa M. McGregor, and her battle with Ovarian Cancer. 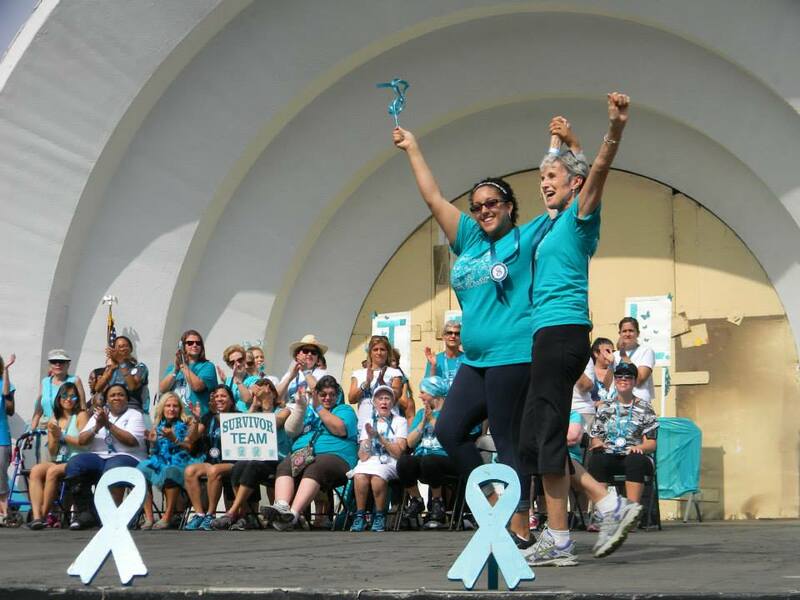 Ovarian Cancer Survivors tell us that they feel like they are part of the family. We are part of their support system through individual and community support. Through our events we have been able to address the varied needs of our survivors and create a sense of community alliance, female empowerment, and therapeutic healing among our participants. T.E.A.L.® 2015 Ad Campaign: T.E.A.L.® chose six Ovarian Cancer survivors to photograph in order to spread public awareness about Ovarian Cancer. These Ads were displayed throughout NYC on subway platforms, kiosks, and buses in addition to local businessand community centers. T.E.A.L.® also interviewed these six survivors and launched a survivor video of their stories as a didactic/educational tool for our presentations at schools, hospitals, community centers, and the internet. Watch this video now! We always encourage Ovarian Cancer survivors to attend all our events. Survivors and their families make up a large portion of returning event participants. At our events survivors are introduced to each other and often make lasting connections with other survivors. We also make a point to honor Ovarian Cancer survivors at all of our events. 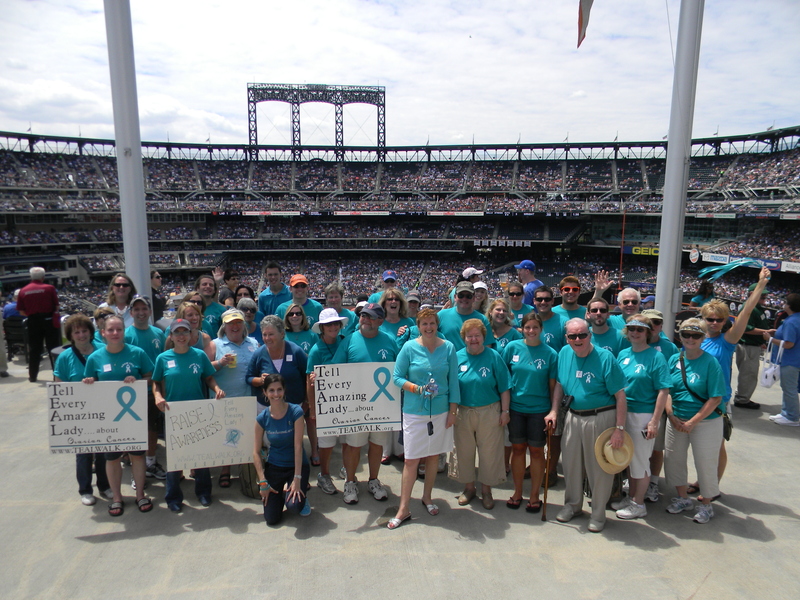 At our Annual Ovarian Cancer Awareness Day at Citi Field we invite survivors to join us on the field to accept The Spirit Award. T.E.A.L.® participates in many other community health fairs and symposiums to educate the community and provide resources to those at risk and those currently diagnosed with Ovarian Cancer. For example, in 2013 T.E.A.L.® was a part of the Maimonides Survivors Rock Party, as well as the NY Methodist Hospital Evening of Spirit among other survivor focused health events. Survivor Ceremony: We honor our Amazing Ladies at our Annual T.E.A.L.® Walk/Run’s Survivor Ceremony. 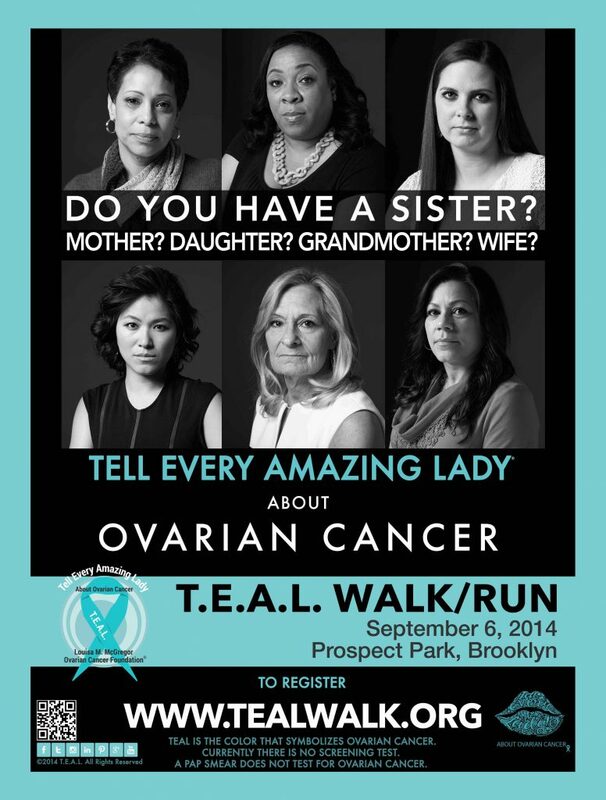 We invite all Ovarian Cancer survivors in attendance to come on stage at the Bandshell at Prospect Park. Each survivor is presented with a different honor each year as a token of her courage and perseverance in the face of such a difficult diagnosis. This touching moment is, for many, the highlight of the T.E.A.L.® Walk and Run. View Survivor Photos from this ceremony here. Educational Booths, Survivor Booth and Interviews: At the Walk we have a special booth where survivors can come, grab some goodies and sit down if they need a minute to rest. 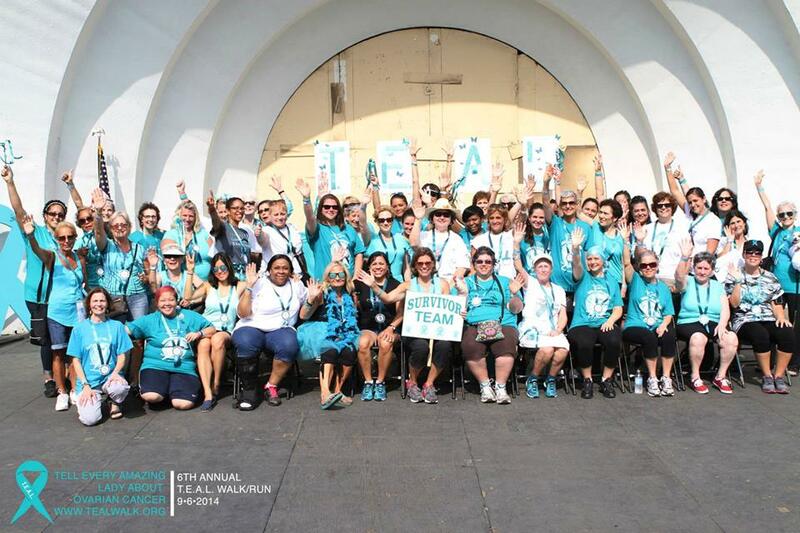 Survivors, who wish to, can give a brief interview on camera telling us about their experience with ovarian cancer and what the T.E.A.L.® Walk/Run means to them. We also have various educational resource booths where survivors can receive materials on important health and wellness information on topics such as support groups, wigs, or genetic testing. We have many of these resources available at our other year round events as well at www.tealwalk.org/resources. T.E.A.L.® Walk/Run Tributes: T.E.A.L.® provides participants with the opportunity to walk in memory or honor of a loved one affected by Ovarian Cancer. Participants are given a sign that they can personalize and wear while they walk. They can also write messages on a tribute cloth at the finish line. Additionally, teams are invited to walk or run collectively in memory or honor of a loved one. Often teams will dedicate their team name to a friend or family member diagnosed with Ovarian Cancer. T.E.A.L.® provides teams with a sign with their team name on it. The Foundation for Women’s Cancer (WCF): T.E.A.L.® helps fund WCF programs that directly impacts survivors including Survivor Courses. Share: T.E.A.L.® helps fund SHARE programs that provide support and resources to women with Ovarian Cancer including an informational hotline, support groups, and educational programs.